The Big News: As with every post-TakeOver episode of NXT, this one was bursting full of lengthy video packages going over the special. In other words, just watch TakeOver. 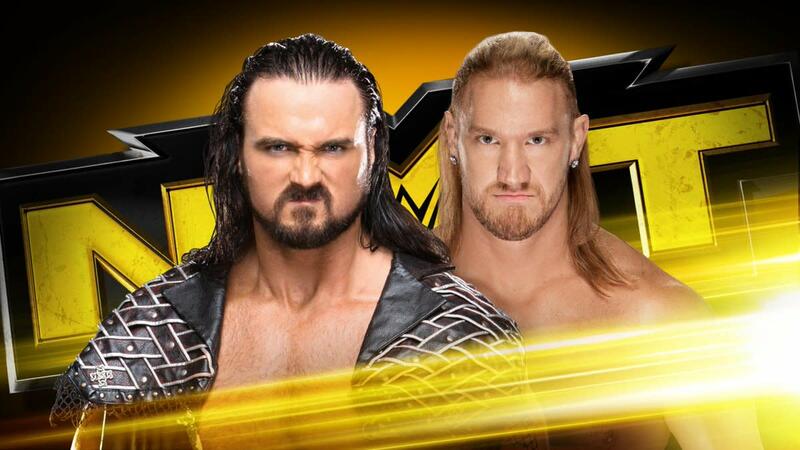 The Medium News: Drew McIntyre continued his winning ways by defeating Wesley Blake in a main event that was better than expected. The Little Beaver-sized News: Velveteen Dream debuted. Good news: He does a good elbow. Bad news: His punches really blow. We were magically still in Chicago. It's almost as if they taped this week's show before TakeOver or something. Curt Hawkins was here to make a star out of Black for the second time, because two weeks ago on WWE Main Event (a show watched even less than NXT Redemption) Black defeated Hawkins. 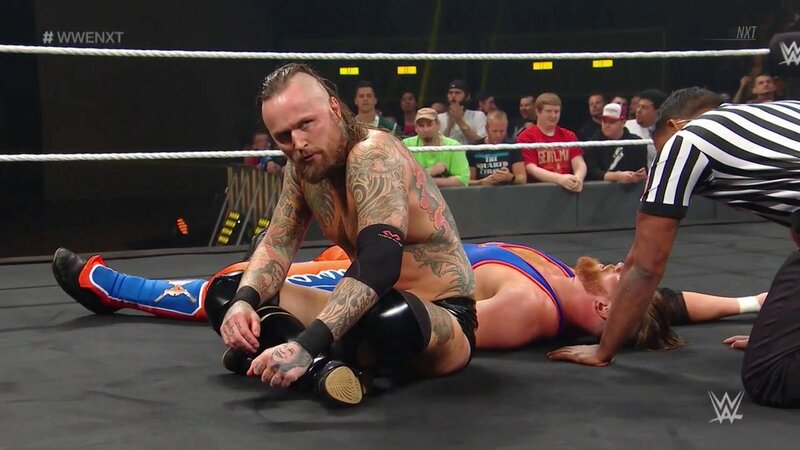 Percy Watson seemed to forget the storyline where he was accused of sneak attacking everyone on NXT Redemption (including Watson, ironically enough), but it was abandoned before it came out that Hawkins and Tyler Reks did it. Anyway, this remembrance of a five-year-old angle almost lasted longer than the match. Black was over coming out and got more over with his skill and athleticism. Hawkins shockingly got in more offense than the average Black opponent. Black broke out a beautiful Asai moonsault and then picked up the win with Black Mass. We got the first of many TakeOver recap video packages, starting with Authors of Pain vs DIY. After a five-minute recap, we were told that “Doctors refuse to release the medical condition of Johnny Gargano.” Great. Ember Moon sat in an empty arena before TakeOver, talking about how awful it feels to be stuck sitting in the audience watching the show, since she got one of her big breaks in Chicago. She said the selfish part of her wanted Asuka to retain the title so she could take it from her. This led to lengthy video package number two, this time on the Asuka vs. Ruby Riot vs. Nikki Cross three-way. Asuka laughed afterwards at the idea that there is anyone else left to challenge her. This show needs more video packages! Roderick Strong vs. Eric Young was featured next. It was the weakest match on the show, but it would still easily have been the best match on Backlash. Kayla Braxton asked Strong what it was like to be the first person to beat Eric Young, which is a lie even if you only consider NXT (he lost to Samoa Joe last year during his surprise debut). Strong said you don't talk about his family and this was his next step to becoming the NXT Champion. Patrick Clark wasn't even called Patrick Clark, however we did pretend like we hadn't seen him half a dozen times already. Honestly, Dream's commercial song was better than his actual theme music. Dream needs to stop punching or throw a thousand punches at his mirror every day. Nothing in between the two, as his punches looked bad. He won with a Rick Rude neckbreaker and an elbow drop from the top rope that actually looked pretty good. That was enough wrestling. It was now time for another video package, but at least it was for the amazing, magnificent, fabulous, one of a kind, tremendous UK title match between Pete Dunne and Tyler Bate. Sadly, this amazing match was recapped in 30 seconds. We did get a Dunne interview where he said he was watching Bate live a dream since January. He said before the match that he would win the title and now everything is his. More video packages! The oh so glorious NXT Champion, Bobby Roode and his title defense against Hideo Itami was featured next. Roode chastised Braxton for sounding surprised that he won. He then said Itami may have earned his title match, but he's not in Roode's league. Roode said his next challenger is whomever he decides to face. He's going home and taking some time off and when he decides to come back, he will. Apparently he has decided to come back next week, because after a commercial we were informed he will have a "Glorious Celebration" next week. Blake, a former NXT Tag Team Champion, was last seen as “Beautiful Blonde Blake,” but he has dropped whatever that was supposed to be and has a new country music theme song. Blake backed McIntyre into the corner and gloated about his advantage, so McIntyre kicked him in the face. It was mentioned that McIntyre won the WWE Tag Team Championship in Chicago, but, for obvious reasons, they didn't mention his partner (Cody Rhodes). Blake took over, using the double wrist lock, but McIntyre just picked Blake up and carried him across the ring. Blake broke out a hurricanrana that turned into a cross armbreaker, though McIntyre was able to get to the ropes. McIntyre hit the Sky High powerbomb, which got a big pop from the crowd, to the point where most forgot to do that annoying “SWEEEEEEEEEET” when Blake kicked out. Blake threw McIntyre into the post shoulder-first and locked on the crossface momentarily. McIntyre came back and hit a reverse Alabama slam (where Blake landed on his face), but that wasn't the end. We kept going back and forth until McIntyre threw Blake off the top rope and hit a stiff headbutt before hitting the Claymore Kick for the win. That does it for NXT. Next week we are back at Full Sail, and until then, remember to say your vitamins and take your prayers!